Turning a space into a place is about providing an area of social congregation. Food and beverage planning is imperative to this however, the design that contributes its textures and layers to the space needs to be equally as inspiring and aspirational to ensure that customers want to stay in the space and return time and time again. On a trip to Toulouse, managing director, Francis Loughran was inspired by the Placa de Sant Jordi (Saint Georges Place). The energy of the place including the sights, sounds and culture were captivating and could be attributed to the well planned nature of the precinct. From iconic bars to casual dining outlets, fashion retailers and live entertainment - the loop of this entertainment hotspot had been closed with every element coming together seamlessly. The food and beverage outlets were what bound the experience of being there. The place consisted of 21 F&B outlets all with enticing and faultless shop fronts, carefully planned seating layouts meant that all the vistas were taken full advantage of and the success of this was proven by every single seat being taken. There were areas for parents to leave children, social circles building in the middle of the plaza and all of which happened with glasses of wine and cappuccinos in hand. The experience of the place in Toulouse asks the question - what makes a precinct successful and how do you close the loop on entertainment and fashion - especially in an urban environment? The answer is quite simply to not deconstruct society but rather build a place of social affiliation of which well planned food and beverage outlets is central. At Future Food, the question is continually raised about how centre management will increase patron dwell time of patrons, encourage them to socialise in the space and how will this space work amongst all patrons - families, singles and multiple users? 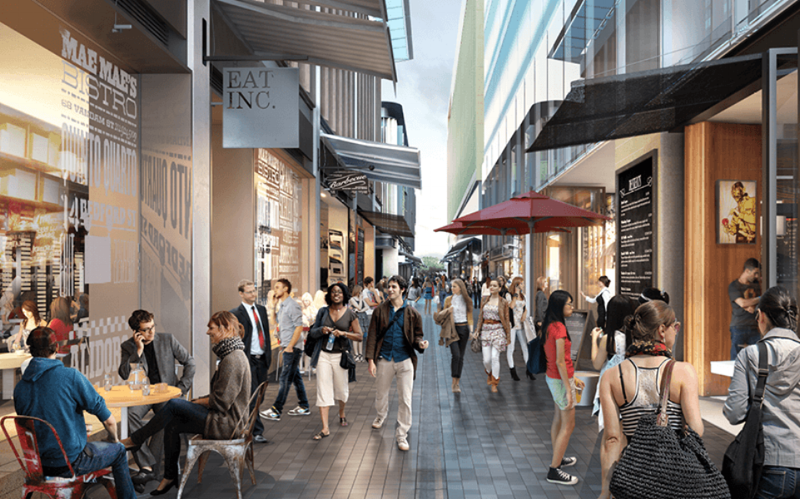 Promoting dwell time will result in an increase in average spend which in turn has a positive impact on the retail precinct. This paired with a well designed and highly bespoke F&B outlet plan equates to a well designed space that functions as a central area of enjoyment. It is not to be said that the need states of comfort, convenience and aspiration of a space should be put aside but eventually it will be well planned food and beverage venues designed to expose external vistas and allow for interaction with the environment and entertainment that will complete the experience of the visit and set the retail centre apart from the spaces and officially deem it - ‘a place’. Are local ‘pop ups’ an option? Can al fresco dining be accepted by the precinct to allow for people to exist in a social setting whilst remaining within their ‘me’ space? The F&B mix must be aligned to the customers who are venturing to the precinct as well as seamlessly relate to the retail mix that is on offer. What makes the space local? Has uniqueness and simplicity been balanced in the design of the public realm? Want to know how you can transform your retail centre into a place and land it on the map as a 'destination'? Get in touch with one of our expert food consultants at Future Food or see our latest projects where placemaking has been at the centre of our customer-centric masterplanning process.